Why not try... Spicy Baba Ganoush with Sumac. Smoky! 1 Preheat your oven 220°C/Gas 7. Pierce 1 aubergine with a knife and roast for 45 minutes until it turns black and falls apart. 2Peel and crush 1 garlic clove, de-seed and chop 1/2 green chilli and finely chop 1/2 bunch of fresh flat leaf parsley. 3 Scoop out the flesh of the aubergine and put into a blender with the garlic, chilli and parsley plus 1 tbsp of extra virgin olive oil, a squeeze of lemon and a pinch of sea salt and black pepper. Blitz. 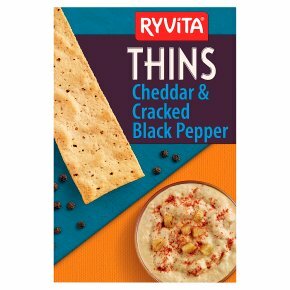 Serve in a bowl with a sprinkle of sumac and tuck in with your Cheddar & Cracked Black Pepper Thins.